27.9 days. Doing a constant speed of just 37mph, you could complete a full lap of the world in that time. You could also make four return trips to the moon. Or, if you're feeling really rock 'n' roll, you could hire a new employee. That's right, just 3 days shy of a full month, the average length of the UK's hiring process in 2016 is record high of 27.9 days (according to Glassdoor research). This is a massive increase over recent years and we endeavor to find out what's the hold up? 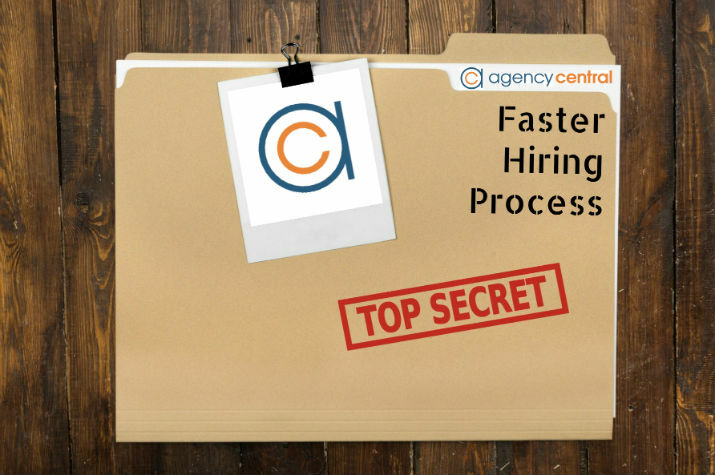 It comes as little surprise that the second highest priority of hiring managers over the next 2 / 3 years is to increase the efficiency of their hiring process (just behind candidate experience if you wanted to know). 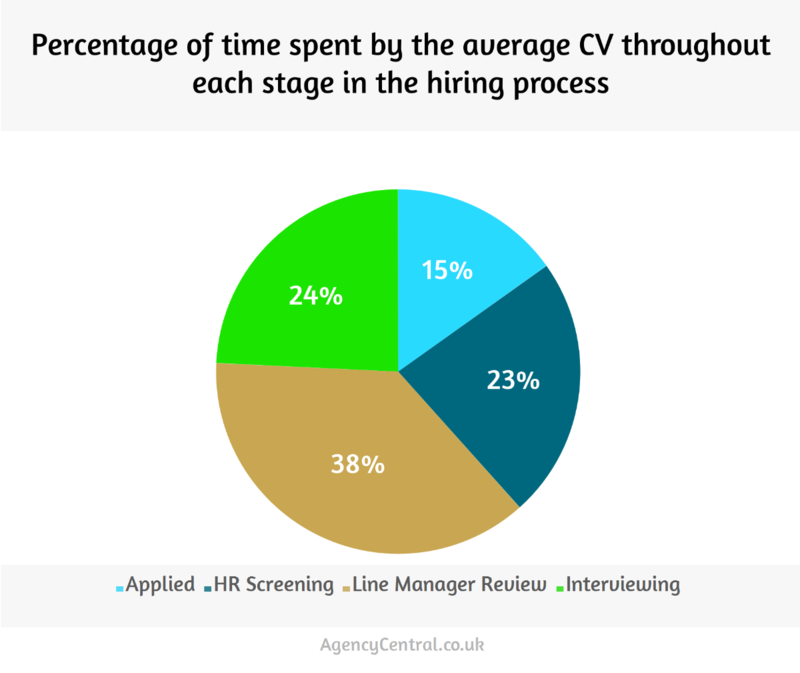 With costly overheads and detrimental effects on talent acquisition, a longer hiring process isn't ideal, but is unfortunately a reality for a lot of UK businesses. Factors that cause this can vary dramatically, depending on company size, procedures involved and position being recruited. So, starting from the top, why are these steps equally responsible for increasing the process time and how can they be streamlined? 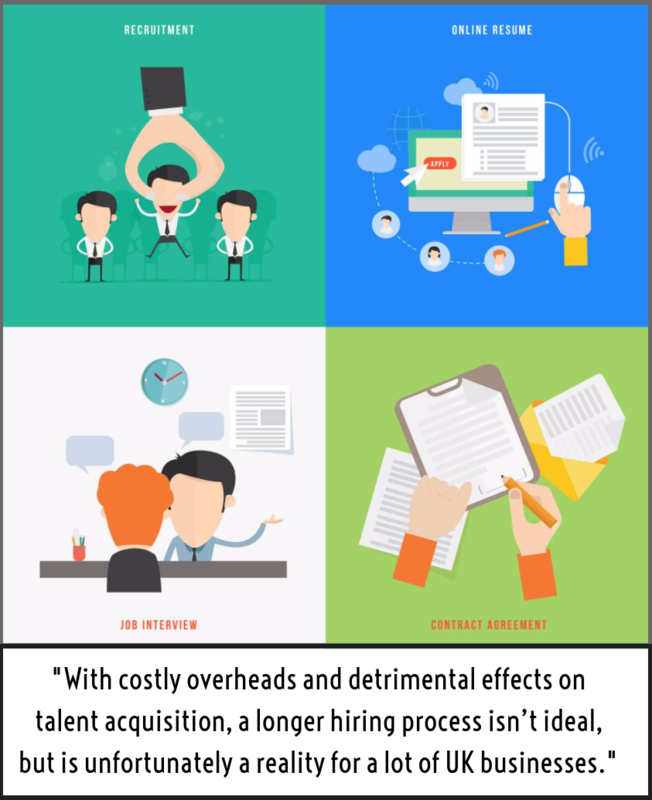 One of the biggest factors in a prolonged hiring process involves the size of the company doing the hiring. Generally a smaller company takes less time to hire new employees than a larger one. Often with less applicants, smaller companies are at an advantage when it comes to the speed of the shortlisting process (although this is also a disadvantage as it means there is potentially less choice of high quality candidates). This means a decision on the final two or three applicants is reached sooner, meaning interviewing can commence quicker than it would at a larger corporation. In addition to this, another factor to consider is that smaller companies tend to have less people to pass through. You'll usually find that the larger the company is, the more managers a CV will have to pacify and more interview stages are required. Although this isn't always the case, a smaller company will generally only require the consent of two (usually the MD and a line manager) to hire a candidate. bad hires can cost a company far more than you could ever imagine. Lastly (and we will go into this in more detail further down), the bigger companies usually have a much more comprehensive procedure in place. The multiple interviews, trial days, background checks and thorough initiation all add a significant amount of time onto the process as a whole. 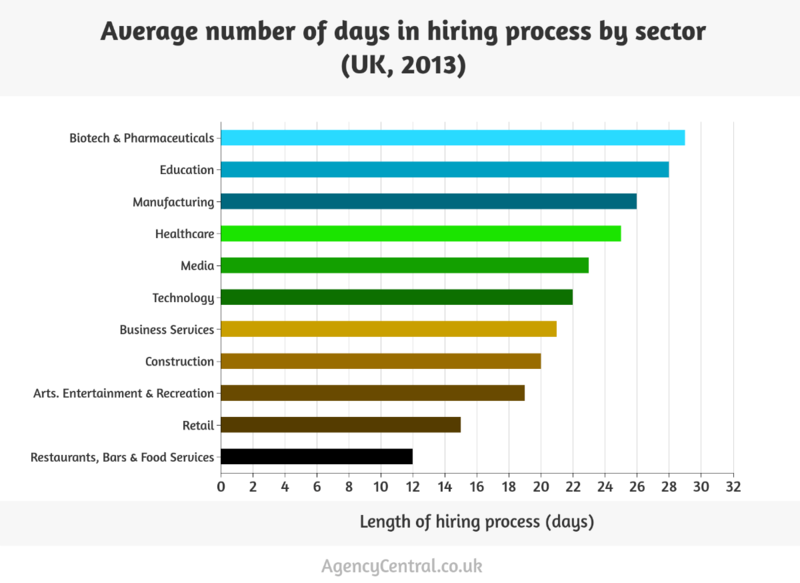 It is clear that, overall, the UK has a much longer hiring process than the US. In addition to this, we can see that the length of the process increases with the size of the company. 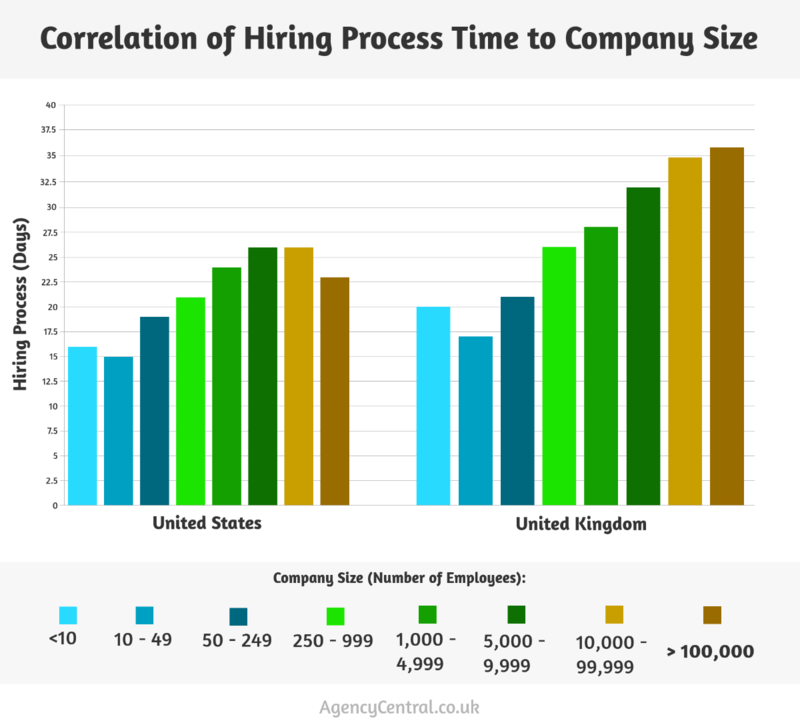 The only anomaly in this trend (for both the UK and the US) are companies with 10-49 employees; their hiring process dips significantly from the previous category (less than 10 employees). The reason for this is possibly down to the fact that a small startup company (<10) is likely to spend a lot more time on hiring the correct staff, as they will be crucial lynchpins to the future of the business. While this sentiment will no doubt remain the same across all companies, it is certainly more of a central focus in the smaller bracket. Another area of consideration the graph highlights is that companies over 100,000 employees (US only) take less time to hire than the previous two brackets. This can't be said for the UK, which experiences a consistent rise. The reason for this oddity is fairly unclear, although staff retention figures in relation to the population difference could be an unmanageable variable that's not reflected in these stats. Regardless of the finer details, it's plain to see that the UK hiring process is much longer in comparison to the US. Now that we are aware of the effects company size has on hiring times, let's have a look at what role job types play in the delay. The next biggest factor on hiring schedules is the position being advertised. Sectors that offer a lot of temporary / seasonal roles (such as Retail and Hospitality) show a much quicker hiring process, as demand for staff is more urgent. Higher responsibility roles tend to take longer on average, as they require a more specialised skill-set and therefore warrant further testing and verification. This explains why a lot of larger companies who operate in areas such as IT and Pharmaceuticals take longer to apply for. The same rule goes for Education, as teaching roles demand a variety of competency reviews and background checks. A CV is nothing more than a glorified printscreen of LinkedIn profiles now, a waste of ink and trees, a semi-archaic custom we abide by even though it's not entirely necessary anymore. Jumping through many hoops like this has become the norm for such skilled professions now, as bad hires can cost a company far more than you'd ever imagine. In light of this, their caution can be justified - but it still proves to be an area of frustration for candidates. Conversely, a more streamlined and efficient hiring process can save lots of money, so finding the balance is key if hiring is to be financially optimised. As expected, we can see that the two sectors with the longest hiring process are Biotech & Pharmaceuticals and Education. The shortest process is unsurprisingly in the Retail and Food Services sectors - both of which tend to require more temporary / seasonal staff. What other factors are influencing hiring time? Whilst the economy is getting better, employers remain extra-cautious in the post-recession re-build. With major political issues around the corner (Brexit being the main point of debate), businesses are wondering how they will navigate such imminent changes from a financial perspective. This is bound to affect their hiring decisions - especially when the wounds of the recession are barely healed. From equal opportunities, fixed-term employment and employee working rights, companies have a lot of factors to consider when it comes to offering contracts of employment. All of these regulations need to be considered and verified with every candidate, which can cause an increase in general administration time. If you've already read our article about finding work after becoming unemployed, you'll know just how negative the impact of long-term unemployment can be. Employers who receive applications from seemingly relevant talent are apprehensive if that candidate has been unemployed for 3 months or longer. This can increase the entire shortlisting process as it causes indecisiveness between hiring managers. All companies are guilty of this from time to time. 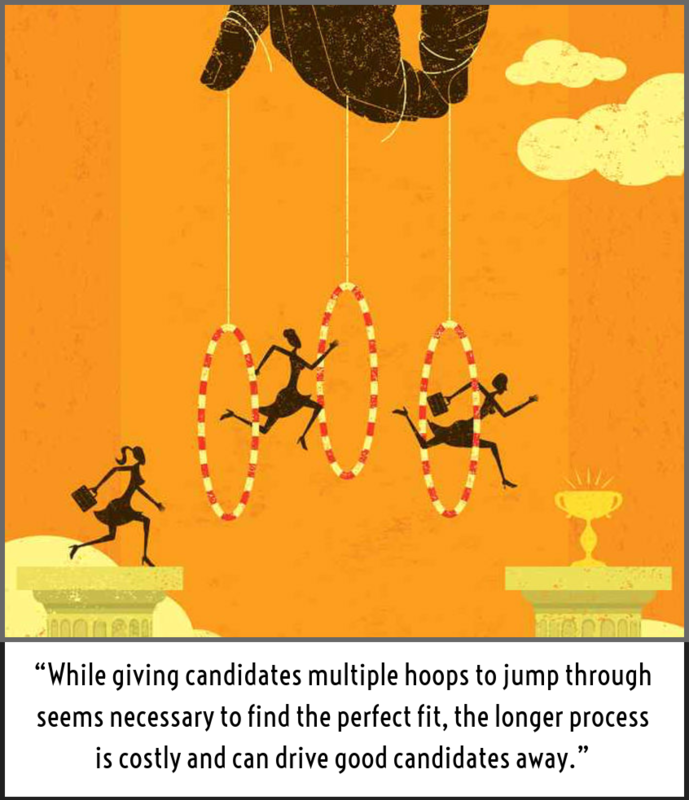 They'll spend weeks trying to find that perfect candidate, exhausting all resources possible, only to find that there is no such thing as a 'perfect' fit for their company. This often fruitless hunt can see a company overlook very capable and skilled applicants in the hope for 'something better' - adding weeks onto the schedule for no good reason. Is there anything that will speed it up? Ah, the big question. Streamlining your hiring process can be done in a number of different ways. Of course these will vary from company to company, so it is important to establish which areas of your specific process are particularly laborious. A thorough examination from start to finish will flag up which sections are causing the most delays; post-hire process appraisals by your existing employees can help with this. From their feedback you will be able to tell what needs refining and speeding up. For some positions, lengthy application forms, background checks and pre-employment screenings are absolutely necessary. But this doesn't mean they have to be tedious and painstaking to complete. Give your company application form a revamp and check whether all 21 pages of interrogation are really needed. Any other checks should be completed as efficiently as possible too, with minimal effort from the candidate required. Pretty self-explanatory. Being organised when it comes to paperwork is fundamental in keeping administration times to a minimum. Keeping each candidate's files in one place, ensuring all documents received are instantly sorted and making their personal information easily accessible to line managers is only going to make this step quicker. Plus, your organisation will serve as an exemplar of the company as a whole - showing any potential candidates that you operate as a professional and meticulous business. There are an increasing number of talent management software options on the market now, offering a selection of functions to keep your candidates organised and up-to-date. Oracle and Halogen Software are two of the better ones available, both offering trials so you can get to grips with how they work and if they would benefit your company's existing management system. An often overlooked area of the process is the job description. An inefficient description of the role being advertised will lead to confusion and apprehension in potential candidates when they are looking to apply. Give the description clarity and ensure it encompasses all aspects of the vacancy in detail. At the same time, try and keep it as succinct as possible. Nobody wants to read a chapter of a novel when they are looking for a job. Use bullet points to effectively highlight key tasks and necessary experience. Getting your job description right will save a lot of time further down the line, otherwise you will have to deal with candidates who have misunderstood or have been unintentionally mislead by the vagueness of the job advertisement. Waiting until after interviews to present your candidates with assessments can cause terrible inefficiencies. There are many web-based assessments available for download, which you can tailor to suit your company. Whether skills-based and/or behaviour-based, you are able to reduce the amount of time (and money) spent interviewing the wrong candidates. Touched on above, technology has certainly changed the hiring process in recent times. With the increasing use of social media for recruitment, both recruiters and employers now have the gargantuan task of narrowing down hundreds of applications for almost every role they post. Sifting through these applications to find the relevant talent has almost become a full-time job in itself so, the question has to be asked, can technology help? Yes it can - to a point. The talent management software we mentioned above is a great way of keeping track of incoming applicants, making recorded contact with each one and ensuring all documents are filed appropriately. There's even software available now that eases the initial workload of wading through CVs manually, as it scans all received for any keywords or errors, instantly discarding irrelevant or poorly written ones. One of the most overlooked areas of the process is the job description. An inefficient description of the role being advertised will lead to confusion and apprehension in potential candidates when they are looking to apply. While this is great for reducing time spent looking through CVs, it can also be a problem. There is always the chance that a fantastic candidate makes one or two typos, or fails to use enough keywords (or the wrong keywords) to pass the 'cyber-caesar' test. Would you be willing to let the perfect candidate slip through the net if they accidentally spelt something incorrectly? No, I wouldn't either and that is why these new systems are flawed. They also fail to recognise certain formats in a CV. So if an applicant has made a snazzy looking table/chart to showcase their qualifications and experience, some bots will fail to recognise the element altogether - meaning their life accomplishments appear as a big fat blank space. When online job applications and a little known network called LinkedIn started to gain popularity, they were seen as supplements to the traditional paper CV. Roll forward 10 years and the world of recruiting is almost 100% digital. A CV is nothing more than a glorified printscreen of LinkedIn profiles now, a waste of ink and trees, a semi-archaic custom we abide by even though it's not entirely necessary anymore. Of course they won't die out (in the near future at least), but they will become less significant. Candidates in 2016 and beyond are judged by much more now - with all of their social networks being examined as scrupulously as their references. As a result of this, Generation Y candidates have a very different expectation of the hiring process to older generations. Marley Dominguez, CEO of Haystack Job Search, states that "Raised on technology, [millennials] do not accept many legacy concepts of recruiting and work. To be effective, recruiters are going to need to engage Gen Y candidates in new ways." Would you be willing to let the perfect candidate slip through the net if they accidentally spelt something incorrectly? No, I wouldn't either and that is why these new systems are flawed. He goes on to highlight how this is particularly true with passive talent. Depending on the company size and strength of brand, some organisations can struggle to implore candidates to apply - therefore have to become more active and creative in their hunt for the best candidates online. Applying for jobs is also becoming much easier than it used to be, with the mobile recruiting phenomenon sweeping across the country. A lot of websites now offer 'two-click' applications that can be done from a mobile phone - meaning more people are willing to simply upload their CV and press 'apply' than ever before. Great news for candidate attraction, but also very difficult to manage - as the easiness allows less qualified candidates to 'try their luck'. I wouldn't be surprised to see more and more 'cutting edge' talent management solutions popping up in the coming years, as companies try to adapt to the scale of the task at hand. Whether these new tech solutions actually offer anything of useable benefit or whether they are simply old ideas re-packaged remains to be seen. "These company storefronts serve as a one-stop shop where job hunting begins, so it's imperative to have a well-designed career site to deliver a cohesive brand image that reflects the company's mission, vision and values. The company brand experience, in combination with detailed job descriptions and an online application, engages job seekers and helps them determine proactively if they are a cultural fit to the organisation, and whether to apply." Hyatt explains above how employment brand is now one of the most powerful tools in attracting the very best candidates. If you can successfully do this, then the only real delay in your hiring process will be trying to choose between Superman or Wonder Woman. As candidate management systems become more advanced, you would expect hiring to become quicker and easier. However, as we explained above, sometimes technology can be its own worst enemy, causing faults and confusions - the kinds of faults and confusions a well-trained human eye would otherwise solve. There is no set blueprint for what software to use, how to structure your process or how many interviews candidates should attend, but using the information regarding the impact of company size and vacancy position, we are able to gauge approximate time constraints to adhere to (or ideally lessen). Ultimately the speed at which technology progresses will be the driving force to a more efficient hiring process.